Yet enthusiasm for the alliance among petrolheads and analysts is muted. 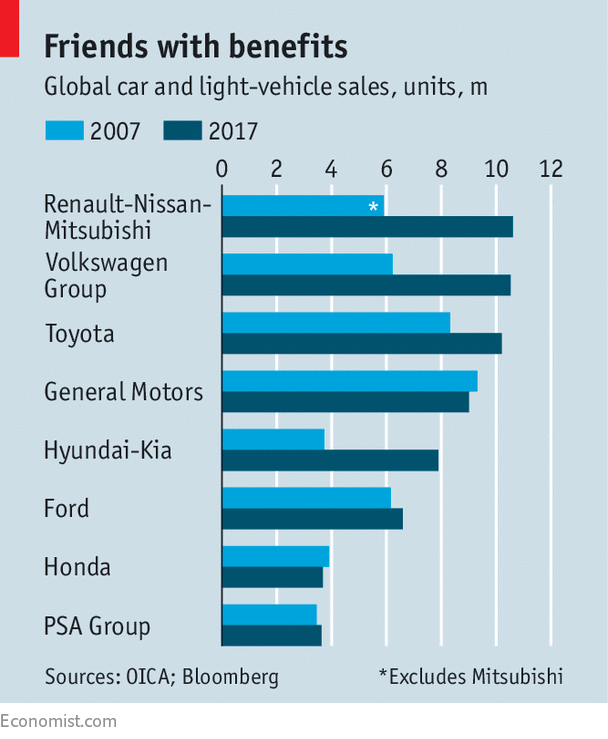 Despite making some sporty models—Renault even runs a Formula 1 team—the group lacks a brand such as VW’s Porsche to set car-buyers’ pulses racing. Those who pore over its financial performance use words like “decent” and “reasonable”. The mass market is competitive and margins are low. Investors cringe at a complex structure. Renault owns a controlling 43.4% of Nissan; Nissan has a non-voting 15% stake in Renault. Mitsubishi is controlled by Nissan through a 34% stake. Carlos Ghosn (pictured) is chairman of all three firms. Last year he stepped down as boss of Nissan but still runs Renault, plus the alliance itself, with its own board and executives. French intentions are hard to fathom. Mr Ghosn and Emmanuel Macron, France’s president, have a history. As finance minister in 2015, Mr Macron briefly increased France’s stake in Renault to 20%, apparently to block Mr Ghosn from pushing through a change to company bylaws that would have inoculated it against a new law granting double voting rights to long-term shareholders. He also reportedly wanted a merger that would keep France as the main shareholder, the better to preserve French interests and jobs. Mr Macron now insists he wants to get the French state out of business. But he still sees Renault as a symbol of French manufacturing might. He may be reluctant to allow closer integration along the lines Mr Ghosn, who opposes state involvement, has in mind. But the appointment in February of Thierry Bolloré, a Frenchman (and likely successor to Mr Ghosn), to a new role of chief operating officer of Renault may persuade Mr Macron that a merger would safeguard Renault’s position at home. Whatever happens, the logic of the tie-up, which fills gaps in partners’ businesses and cuts costs, is clear. Renault’s strength in Europe complements Nissan’s in China and America. Nissan brings a premium brand, Infiniti. Mitsubishi offers expertise in plug-in hybrids. By 2016 the alliance claimed annual savings of €5bn ($6.2bn), despite making just 2m cars on two common “platforms”, the basic underpinnings of a vehicle. In September a new five-year plan promised deeper integration. By 2022, 9m vehicles will be built using four platforms. Savings are promised to double. In order to “turbocharge” performance and growth, at the start of the month Mr Ghosn announced more convergence of purchasing, engineering and manufacturing. On March 14th new managers were named. Managing internal friction may distract Mr Ghosn from keeping the alliance growing. So far it has, despite challenges facing the mass market. Scale is vital to be able to invest in electric and autonomous vehicles, Mr Ghosn believes. He aims to sell 14m cars a year by 2022. Max Warburton of Bernstein, an equity-research firm, likens the group to a “hustler” for its skills in sniffing out opportunities. With German carmakers dominating the most profitable bits of the European market, Renault pushed Dacia, its successful low-cost brand. Early investments in electric cars will ensure the alliance is the first to turn a profit from them, according to UBS. A big bet on emerging markets looks inspired. But Mr Ghosn’s acumen has a drawback: it has made him seem indispensable. Succession planning has been overlooked. Impatient contenders such as Carlos Tavares, now boss of PSA, have quit. It will be hard to re-engineer an unusual structure and replace an unusual boss while keeping the hustle going.